18mm x 18mm Alphabet letter charms in Wax Seal Style. These very popular, hot trend charms are available in antique silver. The back is textured. 3/4" x 3/4". Lead free, nickel free. Pack of 6. 6 of the same letter in each pack. 18mm x 18mm Alphabet letter charms in Wax Seal Style. 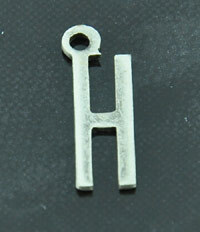 These very popular, hot trend charms are available in antique silver. The back is textured. 3/4" x 3/4". Lead free, nickel free. Pack of 6. 6 of the same letter in each pack.